Dr. Michael Neiman, fondly known as “Dr. Mike” graduated from NYU College of Dentistry in 2005. He then completed a general practice residency at Woodhull Hospi­tal in Brooklyn, New York. 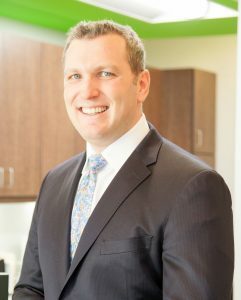 After working as a general dentist in New Jersey for 2 years, Dr. Neiman began a pediatric dental residency program at Maimonides Hospital, where he served as Chief Pediatric Dental Resident. He subsequently worked as an attending pediatric dentist there, and he is currently on staff at Morristown Memorial Hospital and Hacken­sack University Medical Center. Dr. Mike has been voted a Top Doctor in New Jersey Family Magazine for the past five years. Dr. Mike’s love for children, evident in his youthful, enthusiastic demeanor, led him to open The Tootharium in 2012. His original dental songs captivate his young patients, and his quick sense of humor always elicits a smile. Children are naturally drawn to Dr. Mike’s playful personality, and his patients all look forward to having fun with their beloved Dr. Mike at each dental visit. Dr. Mike’s goal as a pediatric dentist is to mitigate the anxiety that kids associate with dental visits, and for his patients to actually enjoy their time spent at The Tootharium. Through his whimsical use of songs about cleaning teeth, Dr. Mike instills lifelong positive dental habits in his patients. Dr. Neiman resides locally in New Jersey with his wife and four children. The Tootharium is a place for your child’s dental care. Our dentist, who is specialized in treating children, has created a dental office which is tailor made to suit the young minds. We have everything in our office which your child may love. Our team of dental professionals is led by Dr. Neiman. Our dentist has mastered the skills of treating children with utmost care while his love for children is something which has come from within.